Note : Use a nickname if concerned about name being shown. Webinars will be recorded. As previously announced on August 9th in this blog, Series of FMO3/TMAU webinars from researchers and experts, RareConnect is sponsoring a TMAU & FMO3 Webinar series for us this coming Sunday, August 19th at 1:00pm EST (6:00pm UK time). Everyone is invited to attend. RareConnect is a partnership project of EURORDIS and NORD, which provides a platform for rare disease patient organization to develop online communities across continents and languages. Therefore, this webinar is not a project of any particular body/breath malodor organization or forum, but rather, we are all invited by RareConnect to come together as a community with common interests and concerns to tell the world our story. If you would like to present your questions in advance, you may do so in the RareConnect site, or you can just join the webinar by going to the Eurordis Rare Connect webinar room for the TMAU/FMO3 webinar. This first webinar is Rob’s debut to our international community, in which he will tell us about EURORDIS and NORD, and all the wonderful tools and opportunities it provides us to help us with our cause. As part of the Communication team, Robert Pleticha is an Online Patient Communities Manager at EURORDIS, and he will be describing the International TMAU Community on RareConnect. "Is it possible to use the media effectively in malodour sufferers' struggle for human right?" 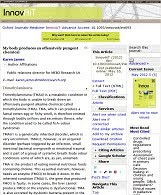 As a community leader, Karen has spearheaded the International Raising Awareness Campaign in the UK medical system, work with UK DUETs, NHS Evidence, National Institute for Health and Clinical Excellence, to publish 10 body odor related uncertainties / questions, now found in the Library of NHS UK database, about the effects of treatment for TMAU. She has authored an article, My body produces an offensively pungent chemical, published in InnovAiT 2012; doi: 10.1093/innovait/ins093, of the Oxford Journals on May 16, 2012. Let’s give Rob and Karen our warm welcoming support and our appreciation for making accessible to us this platform to achieve our aims, to promote research and to provide us with a network that could potentially assist us in achieving our goal. Hope to see as many visitors as possible in this first event. maybe there should be a "will you be joining in?" sidebar to show how many will be logging in . The last webinar we had on microbes and us gave us the opportunity to hear a lecture about microbes. But the best part was being able to bring it to a sufferer's primary concern with the Q&A session where sufferers asked many pertinent questions that Irene answered well.